The Office of the National Coordinator for Health Information Technology and the National Cancer Institute congratulates Dr. Michelle Longmire and the Medable team for winning the Crowds Care for Cancer Challenge with their submission Together. The challenge asked app developers to create new tools to help survivors manage their cancer care after they have completed treatment. The Crowds Care for Cancer Challenge builds on the efforts ONC has undertaken to providing tools and information – like those that could be integrated into Blue Button based tools – to both patients and providers to help better manage health and care. Having more health information benefits patients and their doctors alike. 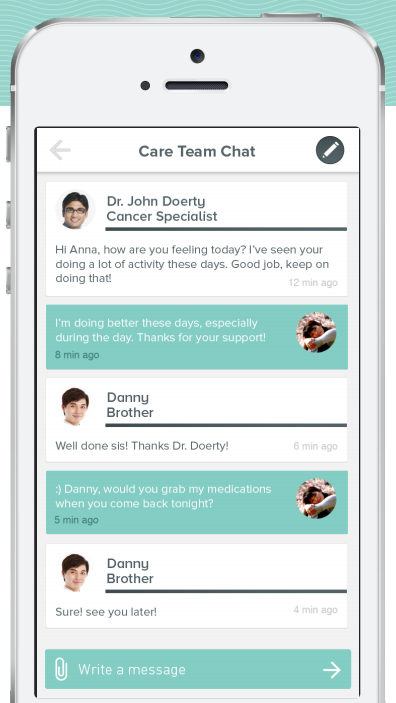 A prominent feature of the app, “Care Conversation” offers patients a secure platform for collaborative cancer care where patients can invite multiple providers to chat about their care, get questions answered and hopefully engage in a patient-centered dialogue. Medable engaged cancer survivors to help co-design the fundamental features of their tool, and focused on improving communication between patients and their care team. Together promises to be a tool that can unite all members of the healthcare team to help cancer survivors transition between specialists and primary care providers. Another stand-out feature that Together will offer when the first version is available in the iTunes App Store in August, is the ability to integrate commercial wearable sensor data – like that from home blood pressure monitors or wearable devices like Fitbit – with relative data handling ease. Together claims to be the first application that enables a patient to share commercial wearable sensor data directly with their healthcare provider. Together was chosen as one of three initial finalists from a pool of 30 applicants that submitted cancer care tools to the first phase of the Crowds Care for Cancer Challenge (CC4C13). In the second phase of the challenge, Together—along with the other two finalists Patients with Power and Journey Forward —launched a 30-day crowdfunding campaign with the help of the crowdfunding platform MedStartr. Soliciting support from ‘the crowd,’ the three teams garnered additional seed funding as well as pertinent feedback for further iterations of their tools. On July 12th the three finalists turned in their final submissions for judging. The review panel was comprised of various cancer care stakeholders – patient advocates, academics, clinicians, and health information technology specialists. Barbara Powe, Director of Underserved Population Research at the American Cancer Society and a member of the review panel remarked that Together “was a very impressive entry. Along with being awarded the $25,000 grand prize, the Together team will exhibit their app at the 2013 Rock Health Innovation Summit August 8th-9th for all Summit attendees. What do you think about the CC4C13 Challenge winner? Share your comments here or congratulate the winner @TogetherGoBig. Join the conversation using #CC4C13.